Yep! It's time! My first ever PB&E giveaway! I've been wanting to do this for a while and decided that today's the day! 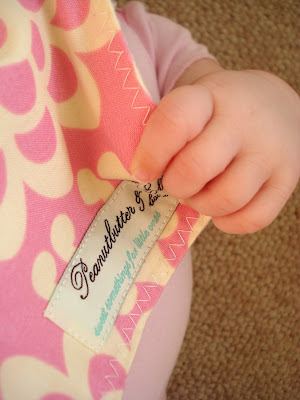 One of YOU will be the lucky recipient of a Peanutbutter & Ella baby flannel receiving blanket. The winner will get to choose boy or girl and I will create a special blanket just for them! I know you all are salivating at the thought of having such a stylish blankie for your little babe! Leave a comment telling me why you should win a PB&E baby blanket. It doesn't have to be a long comment but something meaningful and more than just "pick me" will do. 1) Follow my blog. If you are already a follower let me know and "thank you"! 2) Blog about my giveaway on your blog and then link back to me. Be sure to let me know that you did so. Please leave an extra comment for each extra entry so that I will know to give you credit. Also....and this is VERY IMPORTANT! Please leave a valid email address with each of your comments so that I will know how to reach you if you win!!! Your blankets are so pretty! I would love to win 1 of your blankets for my 6 month old, I can see it being a treasured lovie! I don't have any children, and as you know God has placed infertility in our path. We are taking brave steps and are very close to seeing His glory revealed to us. I would love a blanket because it would be the first thing for our little one! Plus it would be a good start to many things from your boutique, and it would make me think of my dear student, Hayden. I blogged about it on my blog, and linked it back. Started following today when I found you!!! Yeahhhhh! You know I am already a follower and I have posted a link on my blog for you! I LOVE, LOVE, LOVE your stuff!! Morgan is already becoming attached to the taggie cloth Jenn & Leigh gave her. She would so love a whole blanket! Thanks. My sister in law just found out she was pregnant so I would to get this for her! Those blankets are beautiful. I am not sure I should be the one to get it but I want it. This would be perfect for my Thanksgiving godson. He is just over 2 months old and he deserves a wonderful blamkie as this. 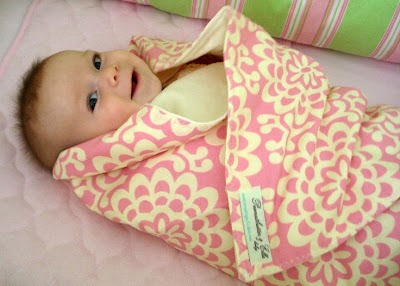 Love your Lillian Minky Baby Blanket, its so cute! Hi! What pretty blankets! I have MANY, and I mean MANY friends who are currently pregnant, so this would go to one of them. Well, a good friend of mine is pregnant with twins and expected to have them next month! I would love to give her one of these gorgeous blankets! Well I just decided to follow your blog, the style is so sharp and clean. I really love it, I'd love to enter the give away, I have a new nephew and I'm sure he could use a blanket. I also might get to blog about your giveaway and will let you know if that is possible. Adorable blankets...thanks for this great giveaway! Unfortunately I am out of the receiving blanket stage...otherwise I would love to wrap my little boys in these. BUT....I do have my 1st niece (in a family full of nephews) that is due in May and I really think that she NEEDS one of these! I love baby blankets and would give mine to a cousin that is due in May! Hello, just found your blog in the forums. Everything looks lovely. It would be wonderful to win a blankie to give to a friend of mine who is having her first baby in March. Thank you!! I am a great candidate for a baby blanket b/c we are praying for the opportunity to conceive again! What a blessing one of your blankets would be! and I am blogging about it on my blog! I've been "stalking" you through the link on Jenn Duke's site... now I am an official FOLLOWER! I'm sure my little son would sleep peacefully with it! Thanks for the chance! That is beautiful, Hana! You have such a wonderful talent. My sister is pregnant with her first born and I know she'd cherish one of your blankets. She's due in July. PS- I'm so glad I'm not the only always-make-my-bed person out there. Good to have fellow supporters :) And you're right...if I don't do anything else at least I'm done that. Have a great day, Hana!! The last homemade baby item i won was given to a single mom to be. God truly blesses life...Now, i would love to give your gift to a special young lady who loves your items and is expecting soon. I will definitely return to your blog site. you are in my favorites. I love to see bright and "happy" colors and patterns on your items. Babies do love bright colors! I just found your site. I have never won anything in my life but think that your blankets are beautiful. Being a new mom to my first baby girl (after having 2 handsome boys) I couldn't think of anything more special to give her. I would be honored to receive one of your gorgeous blankets. My sister would love it as her first official baby gift. Thanks! i'd love to win a baby blanket - for my baby - who, poor thing, doesn't have anything new of her own. she has to take her big sister's hand-me down clothes, toys, and yup, blankets. I would love to win this blanket and give it to my sister- she's due in April with her second! :D So excited! Its a pitty I can't enter because I am in the UK! Unfair! I am following you anyway though! love the blog. Let me know if you change your mind, if I won I wouldn't mind to pay additional postage costs! I am expecting my 2nd baby due in June which is a blessing! I am also doing a give away this month and every month! Its international ;) so come and enter!!! I love the addition of piano music to your blog:)!! As a pianist myself, it's nice to hear other artists' work. If you'd like to hear some of the music i create, give me a listen at http://www.myspace.com/fromapianoa. I could use more blankets because my sweet little baby girl loves to puke on all the clean 'blankies'! I'm a new follower, yay! Adorable blankets ,thanks for this great giveaway! I have to say the baby picture on the giveaway page, is so adorable! I'd love if you enter me. I have lots of friends and family expecting babies and I'd love to give them such a lovely gift! We are getting ready to have our next baby. It would be great if he had a new blanket instead of just hand-me-downs. I would love this to play peek-a-boo with my 8 month old son who has just figured out to pull the blanket off his head! It is so cute. I would really love to win! We are due with our, unexpected 4th, baby. Her name is Willow Fae and we do not have a lot of baby items! 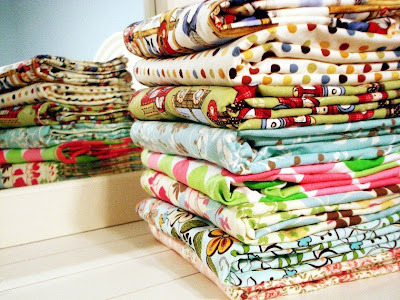 your fabrics are adorable! i would love to win a blankie because i have so many friends expecting babies and i know they would just love swaddling their children in your creations! i subscribe to your blog now! I would love to win this for a couple friends of mine who are expecting their first baby this year! This would be such a great gift, not only because everything is so cute but also because she loves handmade things. I'm also following your blog now. :) Thanks again! I'd love to win this for my (hopefully) soon to be pregnant friend! i would love one to give as a gift. I'm going to be aunt this summer, so I'd love to win it for that reason. Ohh such a great giveaway! My nephew is in dire need of cool baby stuff and I am out of time! He'd really appreciate s neat blanket and the chance to be an individual and stick out from his cookie cutter parents! Hello! Your blankets are lovely. is expecting and it would be wonderful to have one of your blankets as part of her gift! Please enter me in your drawing. I am a fan/follower of your site! I know my daughter would love to snuggle up to one of these sweet little blankets and it would give her something special that wasn't a handmedown from her sister. I am expecting our fourth baby. After already having three....it'd be nice to get something new for the baby. Thank you for the chance to win! i would love to win because my dear friends were finally able to adopt after waiting three long years and i would love to give them this as a gift!! I would love to win one of your darling blacnkets because I have loved your shop FOREVER and you are always so sweet in the forums! Your items are beautiful and I simply cannot sew!!!!!!! I would love to win this for my new baby nephew! I would love to win this because money is tight and I am in need of a baby gift for my best friend who is going to give birth any day now. I think your work is amazing, what great blankets. thanks! I would like to win your giveaway to put into a homemade gift basket that I am working on for one of my daughters friends. I decided to make/buy everything for her homemade... there is a history and special kind of love that goes into homemade and I want that child to be able to know now(okay, soon as born) and in later years that he/she was surrounded by love no matter what!! I just found out last week I am going to be a Grandmother! I'm putting a crib in my spare room so the baby has some place to sleep when he/she visits. I would love to be entered in this giveaway! I have THREE friends who are just entering their second trimester and we are trying to conceive ourselves. With all the baby showers and baby excitement, I am trying to give all handmade gifts for mums and babies! I would love to make one of those gifts one of your gorgeous receiving blankets! Whoa a giveaway! What a great idea. I would like to win, pick me, pick me! I absolutely adore your stuff! I'm expecting my first little one in June and have just begun to dive into the precious things of babes. With the economy and my husband heading back to school full time, I'm working to make wise decisions on what to purchase in the maze of baby items. A precious blanket would be such a gift to us! i'd love to win one to give to my cousin for her first child. I am now a follower. Your blankets are gorgeous. I would love to win one for a friend who is special to me and this is a special prize. My niece is going to be born soon! I would love to give her something special for celebrating her birth! My sister is expecting, and I'd love to give her something handmade. These look amazing! This would be great for my little one because it's so cold out and I would love to have him sleeping with something special! Thanks. Thanks for such a cute giveaway!! I would love to receive one of these adorable blankets!! I have just the perfect little thing to place in it and she told me she would love to have one of these! Check out our blog if you'd like, we are also doing a giveaway right now, it will be for a necklace of your choice! Your stuff is great. I have a girlfriend who is due any day now and this would be an awesome gift for her! I would love to win this for my little girl because I love her! :) And I would love to give her such a gorgeous, beautiful, timeless present! I can tell it would be truly treasured by my family! Thanks for the chance. I recently found you from Etsy and now I am a follower! I love the blankets. Very pretty! You are very talented and I love everything that you make. I would love to have a blanket. My daugter is 5 months old and she is the love of my life. I want her to have something that is truly beautiful. She deserves it. Thanks for everything you are doing. You inspire me.